Southern Australia is experiencing a series of very hot days since Christmas. Here in Murray Bridge, South Australia, we have experienced most days over the temperature of 35C (95F) with several days getting as high as 45C (113F). It’s been hot, very hot. On days like that I appreciate the fact that I don’t have to go out to work in the sun. I can hunker down inside, get on with my reading or writing with the air conditioning drifting cool air throughout the house. Not so for our bird life. Many of our wonderful garden birds really suffer during such hot spells. I keep our various bird baths topped up with clean fresh water, and there is a constant stream of birds visiting for a drink, and often for a splash. The Magpie Larks (see photo above) are really keen to come to the bird bath in our front garden. We have a good view of this spot from our sun room which also doubles as a bird hide suitable for photography as well. 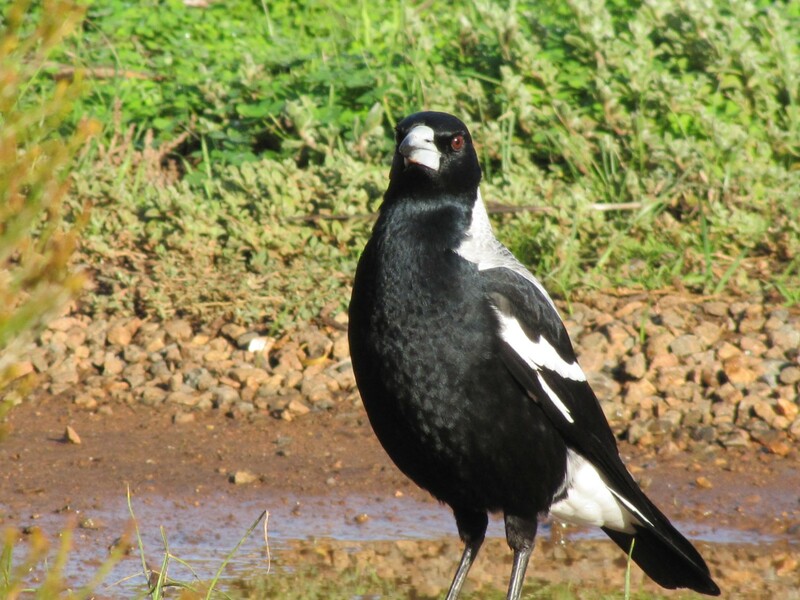 The Magpie Larks don’t have the water all to themselves. 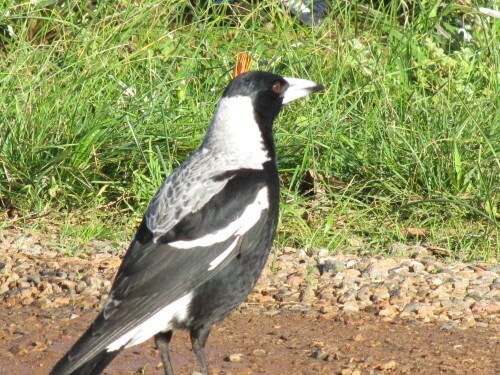 The local resident Australian Magpies also love to come for a drink and to bathe. The magpies can be very bossy, too. They like to either stand in the water – or sit in the water, often for an hour or more at a time. No sharing, just exclusive occupation. Perhaps I need to set up a booking system. I was working at our picnic table on our back veranda yesterday. I was marking a brilliant essay written by one of my uni students; she obviously listened well to my lectures and absorbed all the important points. Either that – or I’m a good teacher. The house was cold after a frosty night and the table was bathed in beautiful winter sun. I decided to take advantage of the sun while it lasted. 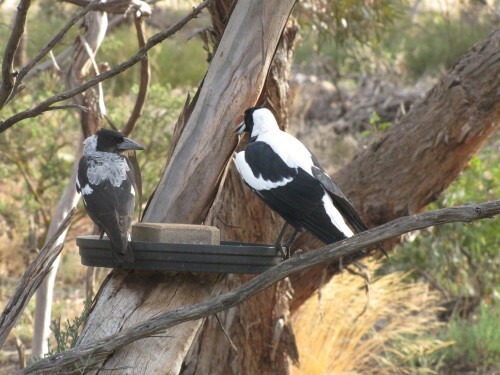 Half way through my work one of our resident Australian Magpies – a brilliantly coloured male – flew in, perched on one of the chairs and then onto the table where he proceeded to strut around in front of me, not more than a half metre from where I sat. He was obviously looking for bread crumb scraps left over from our lunch. He stayed for several minutes before a juvenile bird joined us, sitting on the BBQ a few metres away. 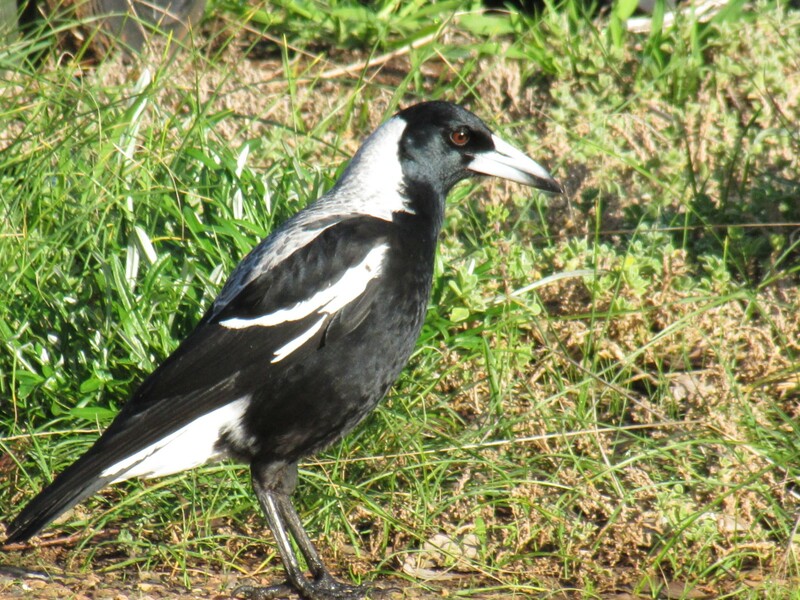 A sudden squawk from other magpies in the orchard startled them both into action, and they flew off rapidly in that direction. Pity I didn’t have my camera with me. Never mind – a similar incident happened to us last year near Mildura when we were having a roadside picnic. On that close encounter, the birds did score a few crumbs from our biscuits – and nearly nabbed a whole one from the biscuit tin left open on the table. The photo below was taken on that occasion. A few days ago we had some wonderful rain. When we get significant falls of rain, we also get sizeable puddles of water in our gravel driveway. The birds often take advantage of the water and enjoy a splash or two. 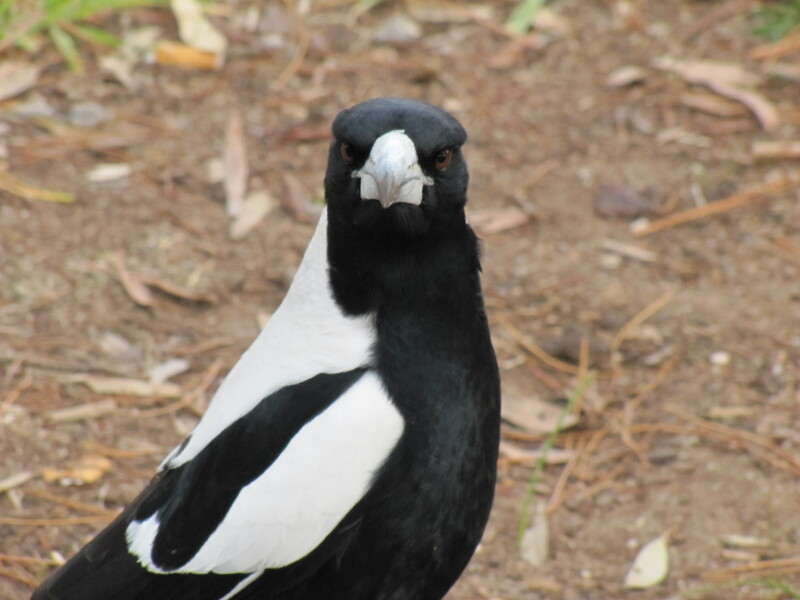 I managed to get a few portrait shots of one of our resident magpies.